Ads like this are springing up in Toronto as people contemplate the prospect of another term for Mayor Rob Ford. Ridicule is the order of the day. A decade ago, this would have taken place in Toronto bars and pubs. (In this once Scottish Presbyterian outpost, spirits and mockery used to meet every day after work.) But, hey presto, nowadays people can do a pretty good replica of the campaign sign. What changed? Well, everything, mostly. The technology is there. Anyone can find a printer willing to bang out campaign signs. But the important change was the willingness to ape the experts and make culture for ourselves. People were once cowed. Making a campaign sign, not just for politicians anymore. When culture was official, we didn’t dare presume. We didn’t dare make it or fake it or board it or hijack it, borrow it or make off with it, or “have a little fun with it.” We didn’t dare hack it. Now we do. Phil Jones inserted himself in someone else’s real estate ads. Goofy realtor smile. Matching shirt and tie. Bad mustache. Ill fitting wig, and all. Phil missed nothing. People have made their own memorials on Brooklyn Bridge. D-I-Y memorials. Hacking public space for private purposes? That’s something. A Harvard student hacked the tour of the Yale campus. Andre Levy, a Brazilian living in Germany, managed to hack the coin of the realm. 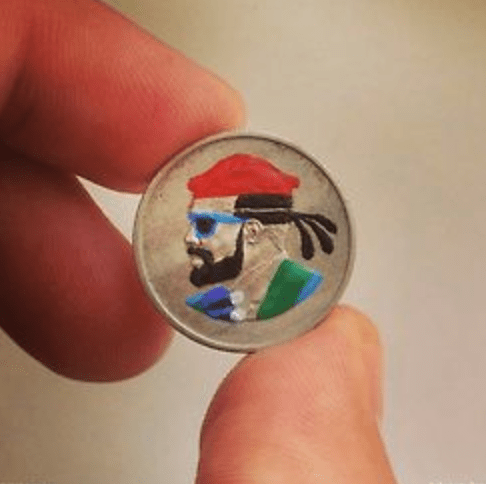 His art now goes everywhere. See more of Andre’s work at talesyoulose.tumblr.com. That’s another difference. Our standards have gone up. We can all dispatch a campaign sign, a painted coin, even a rehabilitated vending machine. This used to be the kind of thing that only MIT engineering students could pull off. Prankster acumen, even this is being democratized. The spirit of hacking is everywhere. It manifests itself even in your niece who bangs out NCIS fan fic effortlessly and with no sense that she is trespassing on anyone’s creative patch. Every consumer is now a producer, or near enough. Everyone is in possession of the skill and the gumption to hack culture. It’s just a question of imagination. More and more, the public world looks like an opportunity for intervention. And for the rest of us, everyday will call for the wariness we exercise on April Fool’s Day. Could this be what it seems? Or is my culture being hacked. 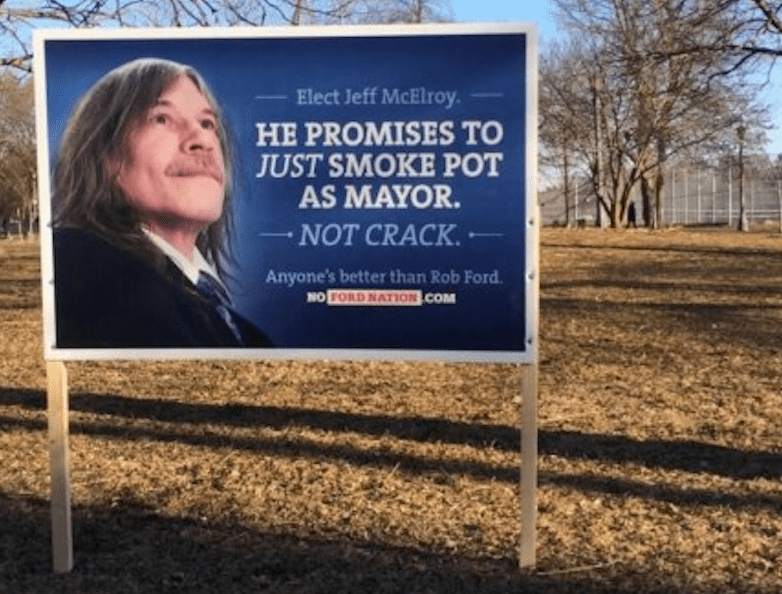 Thanks to Leora Kornfeld for letting me know about Toronto campaign signs. Speaking of hacking Toronto politics, there is a great experiment taking place on Twitter. It’s the work of someone (I will name him if he lets me) who has taken the name of Bert Xanadu and the persona of the Mayor of Toronto circa 1973. Follow him as @moviemayor. It’s like Groucho got a Twitter account. For more on hacking culture, see my book Culturematic. This entry was posted in Uncategorized and tagged @moviemayor, advertising, All Your Base Are Belong To Us, Andre Levy, April Fool's Day, Bert Xanadu, culturematic, D-I-Y memorials, hacking, hacking culture, hacks, Harvard tour of Yale campus, Leora Kornfeld, MIT pranks, NCIS fan fic, Phil Jones, pranks, Punk, Rob Ford, Toronto, UNICEF, vending machines on April 1, 2014 by Grant.